Look out for the most dreaded flaw for marriage Ask Our Experts! Among the few most troublesome Doshas (flaws) signified in a horoscope as per the principles of ancient Vedic Astrology, Mangalik Dosha is the most detrimental for the marital bliss of a couple. Mangalik Dosha is single-handedly capable of ruining the happiness & harmony among a married couple. Therefore in Indian households, utmost priority is always given to look out for Mangalik Dosha in the charts of both the boy & girl before marriage. It is highly recommended to consult an experienced astrologer to get your Personalized Mangalik Dosha Report to perform timely remedial actions to avoid problems. It contains a comprehensive analysis for Mangalik Dosha in a natives horoscope/natal chart. 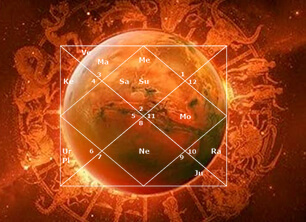 It analyzes the cruel aspects or positional presence of Mars (Mangal) on the prime house of marriage. It calculates the period of operation of an ill placed planet Mars to identify the turbulent times ahead. It suggests timely remedial measures to negate those turbulent times before they even come into play. By identifying the presence of Mangalik Dosha, one gets to know about the actual state of his/her marital life. This report gives incredibly powerful & result oriented remedies to remove the ill effects of Mangalik Dosha. By curing the Mangalik Dosha, good health of the native and his/her partner is ensured. Pacifying planet Mars, results in a stable & harmonious marital life. Cure of Mangalik Dosha also removes the financial problems posed by an ill placed Mars.